PLUS: TIPS FOR SELECTING A DJ. PANOS, WHAT'S YOUR DJ STYLE? Your event, your way and even better. I combine your favourite songs with my crowd pleasers and some personal favorites. I always observe the dance floor and try to keep everyone happy. My aim is diversity with flow. I mix and match beats like a nightclub dj. Apart from weddings, I have an experience for nearly every kind of music out there, very few djs can claim that. You can look at the bars and clubs I have DJed so far and my compilations to get an idea. With my expertise and creative flair it will always be about your style, we will work together so that the music will exceed your expectations and make your celebration truly unforgettable. WHAT KIND OF MUSIC DO YOU HAVE IN YOUR COLLECTION? Almost everything! It's not about having the music. I have played ALL of the following genres at some of the most demanding bars in Athens. 50s, 60s, 70s, 80s, 90s, Big Band, Jazz, Nu-Jazz, Lounge, Classic Rock, Dance, Commercial House music, Electro House, Deep house, Funk, Hip Hop, Motown, Oldies, Pop, Punk Rock, R&B, Rock, Rock 'N' Roll, Blues, Disco, Soul, Swing, Latin, World, and of course traditional Greek for weddings. WILL YOU TRAVEL OUTSIDE OF ATHENS FOR AN EVENT? Yes. Actually this is what I usually do every summer. OUTSIDE OF ATHENS: Travel rates will apply, depending on the distance from Athens. Am I worth it? Definitely, local djs rarely have my experience and they are not able to provide videos with fantastic testimonials and "live" action from previous events like I do. You can think of my travel expenses as the safety belt for the success of your celebration. OUTSIDE OF GREECE: I'm also available for a wedding party in another country, the appropriate sound and lights equipment can be easily arranged with a local company and my recommendations. DO YOU CHARGE ON A PER-HOUR BASIS? WHAT IS THE MINIMUM AMOUNT OF HOURS YOU WILL DJ FOR? DO YOU CHARGE OVERTIME? No minimum time, no extra time. Most of the times it's music from the first guest coming at the venue to the last one standing. The price that you will get will always be for a no time limits reception (coctail hour, dinner, party). The longer it will last the happier I'll be. Please contact me for any other special requirement. No, the whole day will be dedicated to you. For receptions in Greece I always bring my own quality equipment. DJing at a place with its own equipment can also be arranged. Be careful though: Venues with pre-installed sound equipment may have some limitations. The speakers may be smaller, the owner may be afraid of disturbing the neighbors (most summer weddings are open-air) and so usually the sound volume is controlled by someone else. Keep in mind that except from my carefully selected equipment I always bring back up staff. This is something that a venue may not provide. WHAT TIME WILL YOU ARRIVE AT THE RECEPTION AREA? I usually arrive 2-3 hours early. To set-up in a non stressful way, and to have the time to coordinate with the rest of the vendors. One and a half hour before the first guest arrives, there will be music coming out of the reception hall. HOW MUCH TIME DO YOU NEED TO SET UP? WHAT ELSE DO YOU REQUIRE THAT THE VENUE PROVIDES? A table is all I need. Setting up varies from an hour for the basic sound package to around three hours for more sound & lights equipment. Sometimes for large scale productions I may set up the day before. CAN YOU DJ BEFORE THE CEREMONY? Yes, additional sound equipment and microphones are available as well. I have some great music suitable for this time. Additional charges will apply as I'll need to set up two hours earlier than usual. We can meet in Athens, and if you live in another city or country we can meet on Skype. HOW MANY OTHER DJS ARE AVAILABLE? No surprises, every information at this website is about me. This is why I pride my proposition as one of the most reliable and crystal clear in the market. Some DJ companies will try to sell the idea that two DJs are better than one DJ working solo. My philosophy is that one good DJ is better than 2-3 mediocre ones. Never, banners and logos can affect the elegance of the party. CAN YOU EMCEE THE EVENT? DO YOU TALK BETWEEN SONGS? If you can stand my terrible Greek accent, I'll be happy to announce your introductions, first dance, dinner, or other information for your guests. Or you can have on of your guests to do that. I don't talk between songs. HOW MANY FAVORITE SONGS CAN WE ASK? As many as you like. Apart from the main songs (entrance, first dance, parent dances etc) you can tell me what kind of music you want to hear in general, as well as specific songs (or do-not-play songs). I can either work with big playlists, or you can just press the "leave it to the expert button". I don't just rely on any given list. With your permission, I'm able to adjust it depending on what's happening at the dance floor. I have done this successfully even with couples from different countries. DO YOU SPECIALIZE IN ANY SPECIFIC ETHNICITY OR INTERNATIONAL EVENTS? I'm very experienced in wedding parties in general and especially with couples outside from Greece and their guests who may come from different parts of the world. I don't claim expertise in a specific ethnicity, but I promise that I'll be the next best thing after a DJ from your own country (my reviews prove that). So far I have been the most popular DJ for non local couples for their destination wedding in Greece, I have successfully DJed for weddings where the bride or groom came from U.S.A., U.K., Russia, Canada, France, Spain, Italy, Ireland, Netherlands, Jordan and the United Arab Emirates. WHAT WILL YOU DO IF NO ONE IS DANCING? Change the genre straight away. But keeping it cool, never from Greek island music to Jay Z for example. Great pre-planning and an experienced DJ who can feel the crowd will prevent those kind of situations. WILL YOU PLAY SONGS LIKE THE YMCA AND THE MACARENA? No, if you don't want to. As an experienced DJ I know how to get your guests dancing without this type of music. On the other hand the rest of the music will be so well selected so If you'd like me to play music like this, everybody will understand that it's just a moment of fun and not my only way to keep the party going. THE RECEPTION HALL OWNER WON'T LET US BRING OUR OWN DJ. The venue gets a commission for "suggesting" a DJ and so if you won't go for their choice they will loose an amount of money. The result is that you get less DJ for your money and also the actual customer here is the venue, not you. If for example at some time during the party the venue manager will ask the DJ to turn the music down, or even put some less successful songs to end the party, the DJ will do it in a way that you wouldn't easily understand. The venue owner is afraid that the DJ will not follow their policy for the music loudness. Very often a couple may select a hotel for their wedding reception for a more stylish environment and even if there are restrictions with the music it's again a nice compromise. But this is something that they should know from before. Even the best venues may hide this important detail from you so that they won't lose you as customers and when it's too late you may face problems that limit your celebration. I've already DJed at receptions at some of the best hotels in Greece and I know how to deal with those situations with a polite way, but the couple's special day always comes first. In any case, you can show them my website or I can get in touch with them to ensure that they're dealing with a professional who can can comply with their policies (as long as you're already informed about them). The DJ is the most important factor for a celebration's success, there shouldn't be anyone preventing you from selecting your own. Be consistent, from my experience even if they won't approve it at first hand, if you'll insist they will finally say yes. If another DJ company has its own equipment installed at the venue, they may charge you for using it, or I can bring my own and be totally free from anyone controlling the sound, or crappy sound systems (both already happened in the past). HOW CAN I KNOW IF THE VENUE HAS SOUND LIMITATIONS? Ideally you should be informed in advance for any sound restrictions and/or a specific time that the music has to stop. If you are unsure or you want a really honest answer you can say that you and your guests are crazy (even if it's not true), that you will bring a crazy DJ (true but don't say that actually) and that you want a really loud wedding party. If their answer is something different from "there won't be a problem" then be careful and ask for more details. 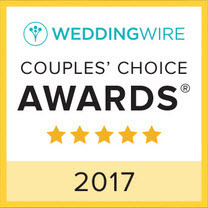 SHOULD I TRUST THOSE WEDDING WIRE REVIEWS? Translated reviews from traditional Greek weddings. You'd better be careful relying on them, Greek wedding parties are very different. Those reviews have also a higher possibility of being fake, why should anyone write in a different language anyway? No blurred lines here, as I always ask my Greek customers to write their review in Greek. Fake reviews. Weddingwire.com may be open for djs and DJ companies around the world but this website is based in the U.S. and it's easier to submit fake reviews in a different country, even in English. Τhe awards of this website are issued automatically, based on the number of those reviews and so... things happen. Many may appear as awarded without any other quality control. Multi-DJ companies can be easier awarded just because they have more reviews. My offer through this website is very simple, straightforward and hard to compete: Real, on camera reviews by mixed and foreign couples, with different music tastes at different destinations across Greece (not from a single reception hall), all for one specific dj. SOME OF THE INFORMATION HERE ABOUT YOU SEEM TOO GOOD TO BE TRUE. Every DJ will try to present themselves with the best way possible - some might even lie - so don't trust anything of what I say, just read and most importantly watch what the previous couples have to say. Every information at this website is 100% true, my compilations indicate a DJ with a good taste in music, the packed dance floors with guests yelling at each transition show a DJ who knows how to play the right song at the right time. Telephone numbers by owners of every bar and club I have worked in the past are also available, as well as telephone numbers and emails by couples who didn't want to speak in front of the camera. The soonest possible for weddings on Saturday from May to October or on Sunday from July to September. Many popular dates of the summer are usually taken from the previous year. Don't hesitate to ask, by email or by calling +30.643511754.